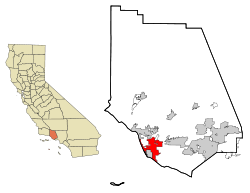 Oxnard is the largest city in Ventura County, California. Over 200,000 people live there. Founded in 1903. It is at the western edge of the fertile Oxnard Plain, and is one of the world's most important agricultural places, that has the strawberry and lima bean capital. ↑ "State & County QuickFacts - Oxnard, California". U.S. Census Bureau. Retrieved 6 June 2015. Wikimedia Commons has media related to Oxnard, California. Oxnard @ The Official Conejo Valley Website, a website with local history, events, and community information. This page was last changed on 15 May 2018, at 12:43.